The core business of recreation organisations is the organisation of events, programs and services for the enjoyment of its members or customers. 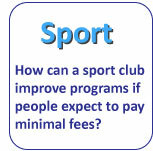 Setting program fees at the right level to maximise the number of participants and program profitability is a major concern of the club's management. In 'profit-oriented' organisations such events, programs and activities are generally fully funded by the participant (program users). The organisation management must endeavour to ensure that the total fees paid by participants cover all the direct costs of the program or event. If this is not achievable, then the program should be cancelled unless it falls into one of the exception categories listed below. The situation is much the same for 'not-for-profit' organisations. However, the revenue from staging a program/event should not only recover all the direct costs but ideally a proportion of indirect costs. This is where problems might occur particularly in not-for-profit organisations. If indirect event costs are not taken into account when setting program/event fees, the organisation's financial health is likely to suffer. An approximate cost of sending a team of 11 amateur soccer players and their coach from Brisbane to Perth may be about $8,000 in airfares alone (even at maximum discount). If the team had to pay all their own travel expenses the chances are they would never go. In order for the team to make the trip a good deal of the trips expenses must be paid by persons who are not part of the team. Traditionally such teams will engage in fundraising to pay part of the trip's expenses. Fundraising may be looked upon as a form of public funding. It is essential for the not-for-profit recreation organisation to find the funding required to close the gap between what people pay for sport programs and what they cost. Increasing revenue derived from internal sources i.e. extracting more money from program users, or their supporters, or by utilising the capacity of the organisation's membership to raise funds (fundraising schemes). Increasing revenue derived from external sources i.e. government grants and sponsorship. This method would be preferred from a point of view of certainty and ease. Larger fundraising schemes such as running an Art Union (a public raffle) can be daunting. They take months to organise and require club members to act as sales agents. The work involved is not always rewarded with worthwhile funds raised. Government funding is generally not a source of funds to 'make ends meet' when running programs and events. Government funding has to be spent in a prescribed manner. Furthermore government funding needs to be applied for up to one year in advance and cannot be relied upon for an ongoing source of funds. In determining an organisation's need for funding, the management committee will need to consider and differentiate between activities which are self-funding from those that are not. For these types of programs and services, the total cost of program delivery should be divided amongst program users. If users are unwilling to pay the costs of the program in full, then the program should be cut down to a more affordable level or cancelled altogether. The event/program necessitated the purchase of special equipment that will be an ongoing asset to the organisation.